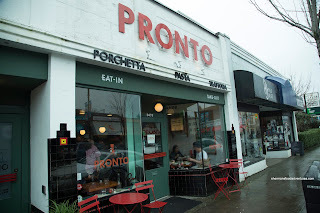 Ever since I stopped by Pronto on Cambie during a Tasting Plates event, it was on my list "to visit". Well, once again, my restaurant ADD kicked in and I totally ignored the place until now. In fact, Grace and I weren't even planning on going to Pronto at all. We were just driving aimlessly looking at restaurants in hopes of something that might catch our attention. 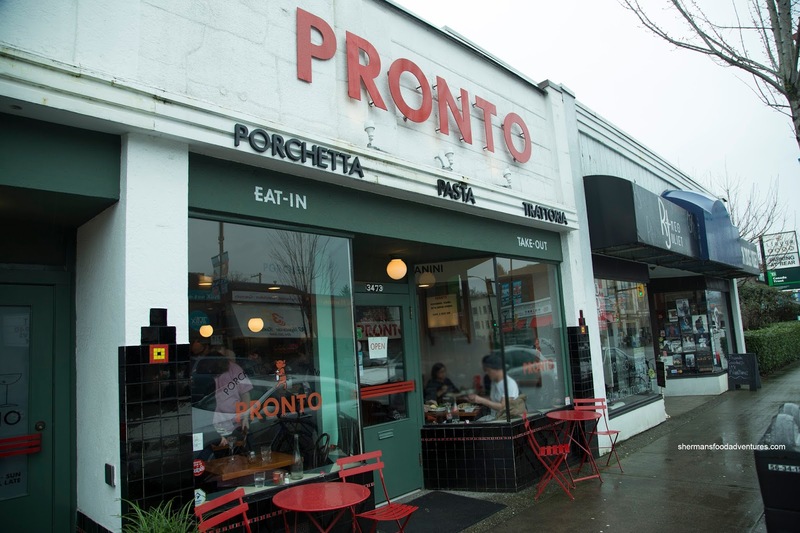 It wasn't until I was at 12th and Main that the idea of Pronto got in my head. Maybe Italian food was already in my system as I had just visited Grotto earlier in the week. Coming out lightning fast, the Tagliatelle Aglio e Olio looked appetizing. 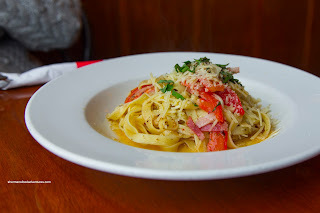 It consisted of handmade pasta with garlic, smoked pancetta and fresh tomato, chili flakes and parmesan cheese. 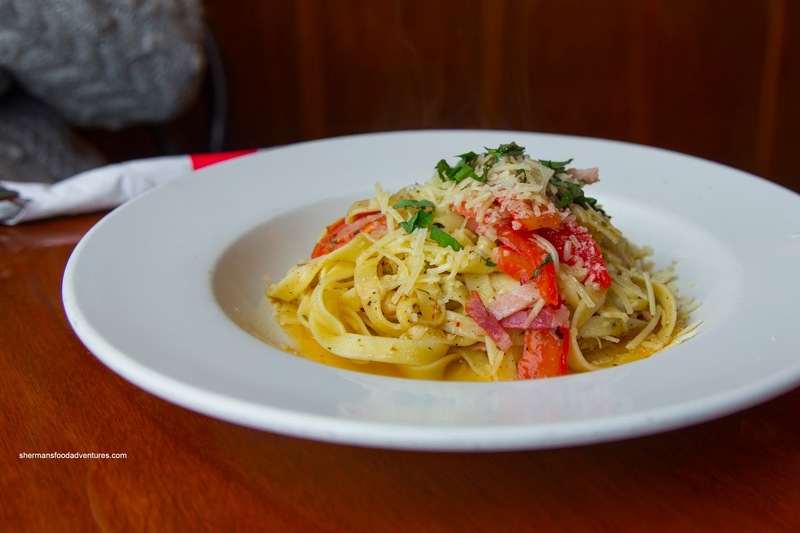 Due to being of the fresh variety, the tagliatelle was as al dente as it could be without being undercooked. The mix of ingredients was super impactful with a touch of spice, tartness and plenty of saltiness. This made up for the fact that the pasta was underseasoned in itself. However, they could've eased up on the grease. 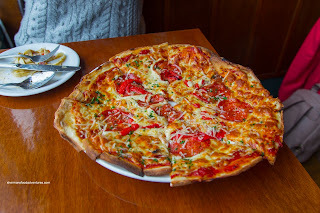 Next up we had the Genoa Pizza with salami, tomato sauce, roasted red peppers and mozzarella. 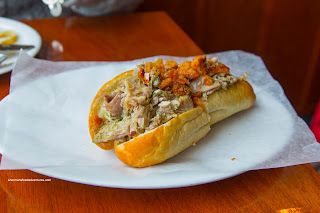 This was not lacking in saltiness and overall flavour as each bite was zesty and a touch sweet. There was a considerable amount of cheese which added to the body of the pizza. As for the crust, it was crunchy throughout. Trying to cover all the bases, we also had the Porchetta Sandwich bursting with roasted pork and topped with cracklings. I thought that the best part was indeed the cracklings as they were lightly crunchy being almost airy. They were aromatic and mildly seasoned. As much as the pork was mostly tender (although not succulent) without being super fatty, there seemed to be something missing. A salsa verde or some form of gremolata would've helped brighten up the heavy meat. We ended off things with an appie in the form of the Prawns wrapped in pancetta. These arrived last as they needed time to cook. Good thing they didn't rush nor merely deep-fried the prawns. This way the pancetta was crispy on one side, yet meaty throughout. 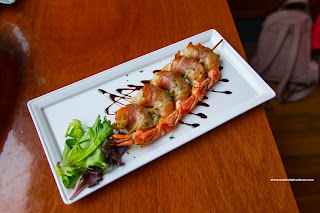 The prawn itself had a meaty snap and was well-seasoned by the pancetta. Overall, for the items we tried, our experience at Pronto was above-average as well as the service and atmosphere.